We, as humans, have basic needs for several things. One of them is food. Another is information. We are always, by necessity and want, taking in both. It’s fair to say we even love both food and information. But we also, as humans, have a propensity for indulging in too much of a good thing to the point that we turn it into a bad thing. It’s easy for us to develop bad habits around any of our basic needs. This is especially true when indulging provides some kind of instant gratification but long-term damage. I submit that generally, our American habits around food consumption are highly analogous to the habits we have around news and information consumption. Similarly, the resulting problems we have because of those habits are highly analogous. We love junk food and we love junk news. And they are both wreaking havoc on our individual and collective physical and mental health, and having detrimental effects on our whole society. It first occurred to me how analogous food consumption and information consumption habits are quite recently, as I have been learning about the other few burgeoning attempts to rate the news. Several of these endeavors say (as do I), that we are trying to create a “nutrition label” for what is in your news. That just makes sense. In many instances, we are simply unaware of what kind of content we are consuming in our news. Is it good, true, biased, opinion-based, analysis-based, or reliable? And how much is it of those things? Right now, there is no standard nutrition label that tells us what is in our news before we consume it, and it used to be that way for our food. I assert that we should at least have some idea of what we are getting into before putting into our brains. Our current media landscape is analogous to the American food landscape during the proliferation of fast-food restaurants and highly processed foods. Note that I am distinguishing between “food” generally and certain subsets of food— unhealthy fast food and processed food, which are characterized by poor nutritional content and low cost. Though food, and even certain types of fast food and processed food were around before the 1950’s and 1960’s, fast food restaurants exploded in popularity and availability during those years, and have continued to grow since. Advances in food science and technology have led to an abundance of available varieties of processed food in grocery stores. There are certainly benefits to fast food; it’s convenient, inexpensive, and tastes good, which provides people with the ability to spend less time and money feeding themselves and their families. There are certainly benefits to processed food too; it lasts a long time on shelves, is less prone to food-borne contaminants, it is inexpensive, there are all different kinds, and it tastes good. However, since the 50’s, we have become acutely aware of the drawbacks of both unhealthy fast-food and processed food; namely, that a lot of it has too much stuff in it that is just bad for you, like fat, sugar, and salt. The last 20 years (when cable news began), the last 10 years (when smart phones became available), and the last 8 or so years (when social media really proliferated) have marked a similar explosion in the availability of all types of news and news-like information. Here, I am distinguishing between “news” and “news-like information,” the latter being characterized by high levels of opinion and analysis and low levels of editorial review.” In the realm of “news-like information,” we now have choices of multiple 24-hour cable news channels, thousands of online news sites and blogs, thousands of YouTube channels, and the constant promotion to us thereof through social media. There are certainly many benefits to this new era of information availability. Personally, I’m optimistic that more information availability to more people can and will lead to increased peace and prosperity in the world eventually, as it has time and time again throughout history. On a basic level, more people are able to know more things than ever before. However, we are now becoming acutely aware of the drawbacks of too much news-like information; namely, that a lot of it has too much stuff that is just bad for you, like misinformation and bias. The reasons we are drawn to fast/processed (and generally “unhealthy”) food and opinionated and biased news-like (and generally “unhealthy”) information are similar. We like fat, sugar, and salt because they taste good and because parts of our brains derive pleasure and reward from eating them. This is a feature, and not a bug, of how our brains work; we’re naturally drawn to eat good-tasting, high calorie food for sustenance and survival. We also consciously know that we need to eat these foods in moderation, and that we need to eat stuff that doesn’t taste as good, like vegetables, because we have this intelligence and capacity to learn this information from our own and others’ experiences. We like opinionated and biased news-like information because being right feels good. Our brains are wired for confirmation bias, which is being more open to receiving information that comports with what you already believe. This is, again, a feature, not a bug, of how our brains work; it makes it easier for us to make sense of the world around us. We also consciously know that we should regularly learn seek out new information, including information that challenges our existing beliefs. However, it’s easy to over-consume unhealthy food and unhealthy news in part because each provides instant gratification, and the drawbacks are not immediately evident. The drawbacks, if any, come from long-term, sustained unhealthy consumption, not from one-time, or infrequent unhealthy consumption. It’s even easier because those who produce food and information are well aware of our desires and are monetarily incentivized to exploit them. Food companies, of course, make more money when people buy more food, especially when that food is cheap to make. Unfortunately, it is easy to make food that is cheap, delicious, and terrible for you. Even worse, making it that way often increases both its addictive qualities and the maker’s profit margin. Though segments of the food industry have embraced healthy food and built successful businesses around it in the last couple of decades, many other segments have not. These segments, namely in the fast and processed food industries have, and continue to, create and aggressively market unhealthy food, especially to people most vulnerable to such marketing. Media companies, of course, make more money when they attract a larger audience. Media companies have always relied on both subscription and ad revenue, but news production and distribution used to be limited to large organizations who had invested significant resources in journalists and print, TV, or radio distribution. But now, because of technology, there are thousands more sources available, and each is incentivized to monetize their source by driving clicks and views. Unfortunately, highly biased, opinionated, low-quality, and “clickbait” headlines and content drive revenue even more easily than high-quality, least-biased headlines and content. Not only have newer sites of questionable reputability supplied plenty of low-quality, highly-biased headlines and content, but their proliferation has, unfortunately, caused historically reputable outlets to start providing some lower-quality, highly-biased content just to compete for audience share. The result of these combinations: 1) our predispositions to unhealthy food/info consumption and 2) monetary incentives for food/info companies to exploit them is a vicious cycle in which many well-meaning consumers fall into patterns of more and more unhealthy consumption. We’ve come to the collective realization as a society that the consequence of unhealthy food consumption is an obesity epidemic. I submit that the consequence of unhealthy information consumption is an extreme polarization epidemic. We are polarized because so many of us are consuming such high quantities of low-quality, highly-biased information. One main difference between food and information in this analogy is that the causal links between unhealthy food consumption and poor health effects have been studied and are now somewhat well known. For example, we know that diets too high in fat, sugar, and/or salt, are linked with heart disease, diabetes, high blood pressure, and a host of other illnesses. In contrast, we are only now starting to study and realize the detrimental effects of overconsumption of low-quality and highly-biased information. Many of us intuitively attribute our increased political polarization to this cause, but it is also highly possible that other detrimental effects are due to this overconsumption. For example, people’s personal levels of anger, isolation, radicalization, or bad decision-making, I suspect, may be attributable to overconsumption of unhealthy information. Many people are blissfully unaware that they are suffering any ill effects from what they read and watch, even though they are consuming intellectual equivalents of donuts and fries at every sitting. I don’t mean to blame or shame anyone who struggles with unhealthy food habits and the resulting health outcomes. So many aspects of our society are set up to have people fail—everything from work schedules, to cost, to availability of options, makes having healthy eating habits hard. I also don’t mean to blame or shame anyone who only consumes low-quality, highly-biased information and as a result, lives in a polarized, ideological silo. Social media has amplified the reach of unhealthy information, made it easy to only consume those articles and shows, and exacerbated our polarization problem. The most important thing to focus on is not what or whom to blame for these causes and epidemics, but what we can do to try to address and fix some of them. The consequences are extremely damaging. It is imperative that we try to find solutions. The bright side of the food/information analogy is that for the unhealthy food problem, we have created and implemented some effective solutions. Our existing solutions are by no means complete—we still have a lot more work to do –but we’ve made progress. One of the first steps in addressing unhealthy food consumption problems was making knowledge available to consumers. Nutrition fact labels, as we know them today, were only mandated as recently as 1994, and they continue to be refined as we learn more about nutrition. Currently, there is no equivalent “nutrition label” for information, though I and others are attempting to create this equivalent—something reliable and widely-recognized as reputable that tells people what is in their media content. There are a number of challenges to doing this, including the fact that trying to tell people what is “good” or “unbiased” is controversial. See more about that here and here. Another challenge is that knowledge alone (i.e., nutrition labels alone) doesn’t solve the unhealthy food problem and obesity epidemic completely. So, will with media rating information labels solve the unhealthy info problem and polarization epidemic completely? Almost certainly not. But can it make a difference and should we try? Almost certainly yes. We have seen a model for addressing our problems with unhealthy food arise in the form of increased knowledge and awareness campaigns and the rise of an entire health and fitness industry. Public, private, and non-profit organizations have implemented studies, projects, and other efforts to let people know that they should eat their vegetables and lean proteins, eat in moderate quantities, limit fast, processed, and other foods with excess fat, sugar, and salt. Nutrition labels were an important part of spreading new knowledge about healthy eating. Many, many food companies and restaurants created and responded to new consumer demand for healthier options: whole grain, whole wheat, low-fat, low cholesterol, low-salt, low-sugar, low-calorie, organic, high protein, and many other types of improved food choices are now available, and they continue to become more accessible and popular. Certainly, there are still challenges to healthy eating, and may people fail to do so. But now, people are armed with more knowledge and choices, and entire segments of the population use those to eat in perfectly healthy ways. More people than ever before can now realistically choose to eat healthy as a long-term, sustainable lifestyle, even in the face of unhealthy food availability. We are seeing the beginning of a similar concerted, societal response to unhealthy information diets. There are academic institutions studying the issue and journalism organizations trying to both create and respond to consumer demand for healthy (good quality, minimally-biased) information. You can see these efforts springing forth in the form of fact-checking sites and segments and new independent, subscription-driven journalism outlets. However, our efforts lag far behind the need to solve the unhealthy information problem. I assert that the problem isn’t even fully realized and identified yet. Namely, we have largely identified the fact that outright “fake” news (lies, deliberate misinformation) is a problem, but do not realize the damage that is being done by news that isn’t completely false, but is highly opinionated and biased. I assert that it is a lurking, unidentified, unrealized problem, like the role of carbohydrates and sugars as dietary culprits used to be. Experts thought that just eating fat was bad—that fat made you fat. Low-fat food became all the rage, but food makers added sugar, which turned out to be worse. We have seen internet giants Facebook, Twitter, and YouTube try to crack down on fake news (i.e., “fat”), without giving a thought to the role that highly opinionated and biased news plays in polarization. That stuff continues to be so widely distributed, I think, in part because it is highly profitable, but also because these companies don’t think it is unhealthy in the first place. There is another dimension to this analogy. One part of the solution to unhealthy food is to not do something; namely, to not eat unhealthy food and choose healthy food instead. Essentially, you can be healthy just by controlling your diet. But there is another positive, related thing you can do to combat unhealthy eating problems—exercise! Exercise actively combats the adverse effects of any past or current unhealthy food habits, and has a whole host of other health benefits. There are lots of ways to exercise—you can play sports, run, do yoga, weight train, join group classes—and all of these things help overall health. The analogous “exercise” people can do to combat a bad information diet is, I submit, participate in civic engagement, which we can call “civic exercise.” There are many different types of civic exercise you can engage in that provide psychic and emotional benefits. I assert that these include having face-to-face conversations with your political opponents, working on your own business or projects that you are passionate about, learning facts about law and government, voting, volunteering for political causes and campaigns, attending town halls, donating to causes you care about, and calling your elected representatives. Civic exercise can take the form of things that actually make a difference in democracy or relationships with your fellow citizens, whether those things are big or small. While consuming lots of unhealthy information can make you feel angry, sad, and powerless, engaging in civic exercise can make you feel powerful, give you a sense of purpose and meaning, and create the feeling that you are making a difference, because you actually are. The big question facing our society right now is how to address this polarization epidemic caused by our unhealthy information diet. I propose that we do everything we can to promote lifestyles of “information fitness.” Information fitness should be a thing. 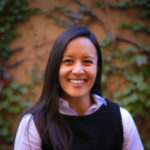 The fields of a “media literacy” and “information literacy”—also known as “InfoLit” have existed for years, but I believe we need to transform this concept so that people are not just competent to manage the information landscape (i.e., not just be “literate”), but that they can actually thrive in it. That is, we need to create opportunities for people to be Info Fit. Info Fitness doesn’t really exist as a concept or industry right now, but the fitness industry didn’t used to exist either. For the longest time, we knew very little about diet and exercise, but as our unhealthy diet and exercise problems came into view, we started to figure out what to do about it. Back in the day, fitness pioneers such as Jack LaLane and Jane Fonda introduced millions of Americans to new, structured forms of exercise. Today, there are millions of resources for helping people eat well, and millions of new opportunities for people to get fit through exercise. Even as recently as a generation ago, people didn’t have nearly as many healthy food or exercise options and resources. Today, people can choose to eat gluten-free, dairy-free, organic, high-protein, vegetarian or vegan, paleo, macronutrient-balanced, and other health-focused diets with the help of the internet, books, plans, and grocery stores. They can choose to run, take Zumba® classes, do CrossFit®, join OrangeTheory ®, do yoga, do pilates, play team sports in adult and senior leagues, swim, bike, endurance race, do home workout videos like P90X® or Insanity®. This entire health and fitness industry sprung up in the last couple of decades and is making a difference in the face of a health epidemic caused by too much unhealthy food consumption. We can and should create opportunities for people to live a lifestyle of Information Fitness if they so choose, to combat this polarization epidemic caused by too much unhealthy information consumption. What would Information Fitness look like? It would start with information nutrition labels, as we discussed before, so people could be aware of what they were consuming before deciding whether they should spend their precious attention on it. If you eat healthy, you know you only have a limited number of calories to eat every day, and you must make choices about whether a particular food item is worth it. Similarly, we have limited time and attention we can dedicate to consuming news. We should actively decide whether what we are about to read or watch is worth it. I don’t think we need to define a “perfect” model for information diet and civic exercise, but I think we can identify some of the big things that are way out of balance in many people’s information diets. If you look back at the chart, you’ll see it goes from fact-based reporting at the top, to analysis in the middle, to opinion down below that, and outright misinformation below that. In this analogy, I submit analysis content is like carbs in many ways. The vast majority of what is available for us to consume are various sources of carbs (analysis). Now, you definitely need carbs (analysis) in your diet—they are (it is) important. But what you need is moderate portions of high-quality carbs (analysis), like whole grain bread (or an article from the Economist). However, most of us are consuming vast quantities of white bread, mashed potatoes, and cereal (like watching a ton of CNN and reading all your favorite partisan online sites everyday). Too much of this, I assert, is unhealthy. What should we probably consume more of instead? I submit your least-biased, most fact-based articles are like your vegetables and lean proteins, so we should probably focus on getting more of those, with, as I mentioned, a healthy, high quality, moderate portion of analysis (carbs). Most of MSNBC and FOX News are donuts and fries. They are ok in small quantities every once in a while, but for the love of God don’t sit and consume those all day. Twitter is candy. Each take is little, gratifying, and addictive. And if you have too much of it you feel sick. We should probably limit our Twitter to small doses. In addition to cleaning up our information diets, info fitness as a lifestyle will require structures, tools, and resources for people to engage in civic exercise. I see these things sprouting up everywhere in the form of community projects, companies, and education initiatives, and they are inspiring. I believe the next generation will have the capability to engage in civic exercise in ways we currently don’t. With a combination of 1) knowledge of what we are consuming, 2) choosing to consume mostly healthy information, and 3) engaging in civic exercise, people can become info fit, and fight against this extreme polarization epidemic. I submit that if more people choose to become info fit, we can make a difference in our politics and in our personal relationships with our fellow citizens. I’m working on doing what I can to help people become more info fit, and I hope you’ll do the same. If you have followed my writing for a while, you know I try not to generalize (because all generalizations are false, including this one). You know I am also highly critical of analogies, because you can always find differences that disprove your analogy. However, generalizations and analogies are useful and necessary rhetorical tools, and this one was compelling to me. It was compelling because we can use the models and solutions we have found, so far, to unhealthy eating problems to create models and solutions for unhealthy information consumption problems. I can’t even express how amazing this article is. Thank you!! Really appreciate the analogy of civil exercise and the note of caution about analogies 🙂 It is a useful framework for imagining ways to combat feelings of sadness, anger and powerlessness. This methodology is based on content analysis, and not polling. There are plenty of polling organizations, like Pew. There is another site called allsides.com that incorporated polling. The content analysis here measures more factors of stories themselves that are quantifiable, not just people’s opinions and overall impressions. Thanks for making and keeping this chart up-to-date! Maybe I’m missing it, but where is the BBC, Russia Today, and Sputnik? My girlfriend and I just had an idea for expanding the chart even further – underneath the nonsense rectangle, you could have sites that are straight hate speech. May be useful as some people may not be aware that certain sites are masquerading. I so hope this goes viral! No wonder this chart is being mocked across the internet, with shameless propaganda machines such as the BBC and CNN shown in the center. Sounds like someone is uncomfortable with how their candy was positioned in the chart, and is lashing out. MSNBC and FOX News are donuts and fries – Did You Check First? How are you placing logos relative to the actual point you use to represent the media source? Consider the rectangle containing “The Washington Times.” The top left vertex of that rectangle is just past the middle of “skews conservative” while the center of the logo rests part way into “hyper-partisan conservative.” Big difference. Requested news source: Newsweek. I’m increasingly seeing it shared around and I know its been around for a long time. Thanks so much for this exercise! My daughter and I are investigating a question your chart raised. Building on the Liberal to Conservative ratings, we would love to see the x-axis values of your data. Would that be possible? Thanks for your inquiry–please contact me at mediabiaschart@gmail.com and let me know exactly what you are looking for. Others label your most extreme liberal least factual media source moderate right. “Information nutritional labels” would be quite challenging, but what about a small first step … stoplight color-code for “factual purity” (along the lines of the WaPo pinocchio-count) inside some distinctive shape, such as square for reportage or polygon for analysis or triangle for opinion. 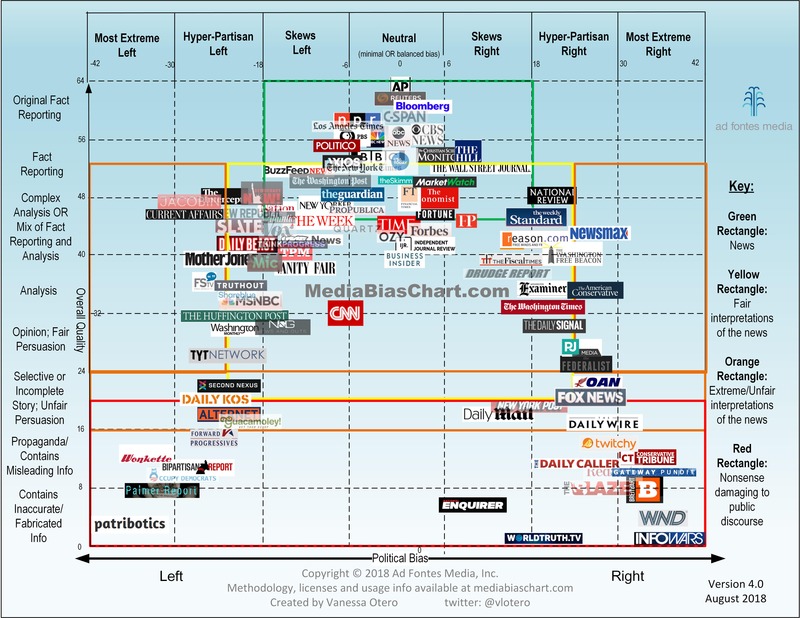 I plan to use your charts in state and national conference workshops I’m doing in August, as well as work seriously with my students to evaluate news sources. Determining the direction and magnitude of media bias is certainly a non-trivial task. I wonder if you have any thoughts concerning the fuss that’s going on with UK’s Daily Mail?